First Runs, Second Runs, Flat Tops, Domes or Bar Stamps Anyone? First runs, flat tops, domes or bar stamps anyone? How is it that I can rationally explain why these myths of the disc golf equipment world are not important, yet at the same time I want to “fall for it” and get my hands on as many CE, SE, bar-stamped discs as possible? After all, while vintage things are more unique, they aren’t magical. They don’t have chain seeking characteristics. All discs are round, and have to be thrown by an actual living, breathing disc golfer. A sure sign of a confident golfer is one who takes calculated risks out on the course, including losing an occasional disc, and just step up with a replacement and try again. In other words, they’re a player who knows they could lose any disc and they’re ready with some version of a replacement. This is the most “common sense” approach to the game, which leads us all eventually to a search for the best discs “out of the box” as well as in regards to durability. I play with some players who only throw Champion plastic, some who only throw Z plastic, and I know a player who uses Pro and DX plastic (all beat up too). The game can be played with almost any disc, including those beginner discs that we put away after two months of messing around before we got a legit Teebird or Wraith or Destroyer. Once you settle on an equipment philosophy, and on disc replacement and selection, the only task left is to actually “execute the plan.” For myself, I can’t do either of these things- as I constantly change my philosophy as well as stray from it when I’m walking down the isles at Marshall Street. If I won the Mega-Millions Jackpot, I would amass a ridiculous collection of plastic. I would spend thousands on ebay getting more CE plastic than I could shake a stick at. …and my game wouldn’t get any better. Although, having just won all that money, I could stop working full time and devote quite a bit more time to improving my skills. In any case, we all have dreams. I’ve heard it said that First Run discs are better, but I’ve rarely heard specific reasons for this. The only attempt at an explanation for this has been the following: When the first run of a disc is manufactured, the mold is brand new and the edges of the discs are crisper, so the best discs that particular mold will create are the first ones. I find this explanation pretty far fetched, since you can’t physically see a difference in the discs if you hold a first run up next to a second or third or fifteenth run (apart from the stamp). 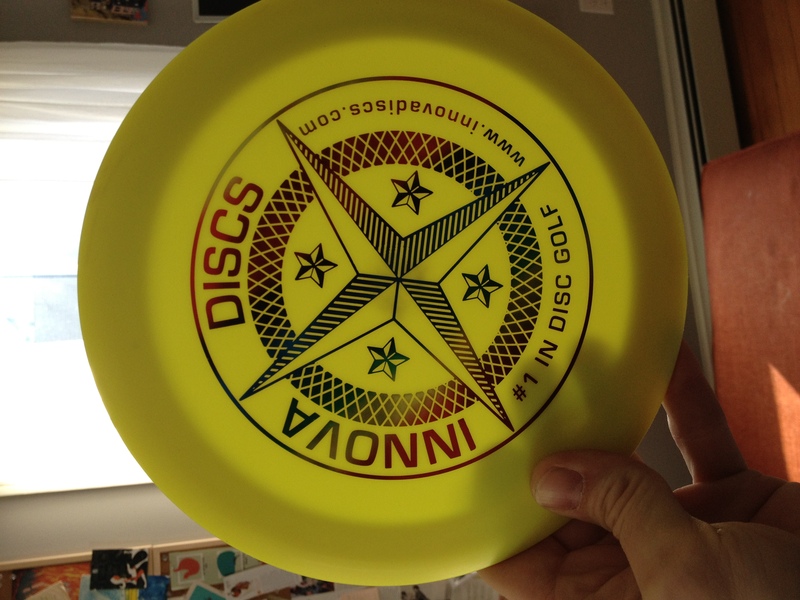 And if this really were the case, why wouldn’t a manufacturer (like Innova) simply replace the mold after a certain number of discs are produced? When it comes to plastics, I do prefer the CE or “Champion Edition” plastics. However, I only have one CE disc. You can’t get a decent CE disc on Ebay for less than 40 dollars. If you find one for 30 dollars, it will be well worn, and you’ll have to pay 5 bucks for shipping anyway… Just recently, I saw a CE Teebird sell for $85.00 and the thing was completely covered with ink on the back (and on CE’s the ink does that ‘bleeding’ effect after only a short time and it can’t be removed). If you’re really a CE fan for the feel, Innova’s Pro plastic is pretty close- but it just isn’t durable. This isn’t a big problem though if you consider the price of a brand new Pro plastic disc is only ten dollars. So all of this is just to say, “Get your priorities straight!” At least that’s what I constantly have to tell myself. First runs really don’t fly farther. Vintage and expensive discs aren’t the only ones that fly straight. Disc ‘shopping’ can be fun, but it’s just shopping. When it comes time to get out on the course and throw birdies, the only thing that can improve your score is having a bar-stamped disc. The shape of the bar-stamp actually helps with the spin of the disc and will pull more spin onto the disc than was actually placed on the disc by the thrower. Most bar-stamps also contain a trace amount of magnesium in the metal foil and that is actually attracted to the sun- which as we all know is typically found in the sky. This keeps the disc in the air longer as well. It’s all about the bar-stamps guys. This entry was posted in Equipment and Gear, Opinions & Technique and tagged bar, ce, disc, equipment, first, golf, run, se, second, stamp, vintage. Bookmark the permalink. Vibram 420 Disc Review: Is This Real Life??? Enter your email address to subscribe and receive notifications of new articles by e-mail.